This blog was reproduced in IRPP’s Policy Options. 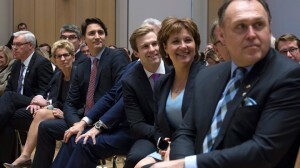 The premiers are meeting in Whitehorse this week, and climate and energy are on the agenda again. For long-frustrated Canadian climate hawks, it’s remarkably refreshing to have a federal government verbally committed to climate action, and a provincial government in Alberta finally taking action to cap the increase in oil sands emissions. But it is also important to keep in mind how far we from having a meaningful climate policy in Canada. A meaningful climate plan needs to have, at minimum, two core ingredients. First, a jurisdiction needs a measurable, enforceable climate target in terms of a level of reductions in greenhouses gases over a specified time period. Second, there must be real, enforceable policies in place that can reasonably be expected to achieve that climate target. Canada is doing reasonably well on the first ingredient, but is a long way from having the second in place. Canada does have a real climate target. The Harper government committed, in the run up to the Paris Accord last December, to reducing emissions by 30% below 2005 levels by 2030, and the Trudeau government seems intent to stay with this target for the time being. According to Simon Donner, this target might be consistent with Canada’s fair share of international reductions to meet a 2°C, although nowhere near sufficient to meet Paris’ bolder 1.5°C target (that would require more than a 90% reduction). 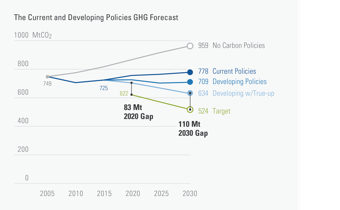 Our 30% by 2030 target would be a much stronger target if it was embodied in domestic law, but at least it provides a measurable objective to guide policy. Canada is not currently on a path to meet this target. The latest inventory report from Environment Canada shows just how far off we are. A more optimistic scenario comes from the work of Dave Sawyer and Chris Bataille, who modelled the expected impact of current policies and also recently introduced policies like the Alberta climate plan and Ontario’s cap and trade plan. 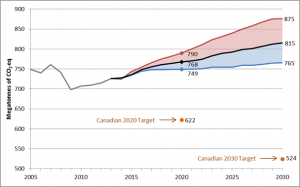 Even if those policies and plans are faithfully implemented, Canada only gets one half of the way there to its 30% by 2030 target (110 million tonnes short of its 2030 goal of 524 million tonnes, from a 2005 base of 749 million tonnes). Where will Canada get the remaining 110 million tonnes of required reductions? There are many potentially effective options – pricing through a carbon tax or cap and trade, regulations, or some combination. Over the past week we have heard fresh commitments from the Trudeau government to introduce a nationwide carbon price even if some provinces are opposed. But there’s no signal, publicly at least, what the level of the price floor will be. Nor is there any indication of how the national price would be coordinated with existing provincial climate policies. The highest carbon tax in Canada is currently BC’s $30 a tonne (a level, we’ve known for some time, that won’t enable BC to meet its own provincial climate target). Alberta will be moving part of its economy to $30 per tonne in 2018, but the Quebec (and soon Ontario price) is only around $16 per tonne. Pledging to establish a carbon price is virtually meaningless unless you specify the price and design, and demonstrate how it will achieve Canada’s target. Canada clearly needs new, bold policies to close the gap and meet its 2030 target. Until now we’ve relied almost exclusively on uncoordinated provincial initiatives: a carbon tax in BC, a ban on coal in Ontario, cap and trade in Quebec, and mixture of pricing and regulatory instruments in Alberta. One important consequence of that is that we have yet to have any kind of national discussion about appropriate burden sharing among the provinces. At present there are widely varying costs of carbon across the provinces. Alberta’s bold new plan, as significant a step as it is, doesn’t actually reduce Alberta’s emissions (p. 26). If Canada is to reduce its emission by 30% by 2030, what should each province’s share of that national reduction be? It seems hard to imagine a political agreement where other provinces reduce their emissions by even more than 30% to allow Alberta to continue its current level of emissions. I hope the premiers can make some major strides towards addressing these issues this week. But that seems unlikely. It’s long past time for the Government of Canada to do what federal governments should do: show real leadership on vitally important national policies. Canada doesn’t just need carbon pricing – we need carbon pricing and climate policies that are actually strong enough to meet our commitments to the international community and future generations. We have a long way to go. This entry was posted in Climate Action Policy. Bookmark the permalink.